Pick it up at Travel Center at main gate of Int’l airports. Save up to 27% OFF ! I confirm that my own phone is unlocked. Only one person can be used one line. Order Confirmation mail will be sent with your voucher. Pick up SIM at designated point. Not allow other user to pick up SIM Card on your behalf. Korean ID or Drive License is available if you have Korean nationality. SIM Activation (Starting) depends on your pickup time. As collecting at 07:00~09:00, starting from 9 AM. As collecting at 09:00~18:00, starting right after. As collecting at 18:00~21:30, starting on the next day 9 AM. SIM starting information will be notified by SMS. Pickup points B is as follows. It is counted on SIM Card switching date and time. It is offered for 90 days by default. It is offered for more than 90 days depending on your nationality. When collecting by foreign passport, expiry is given 90 days. 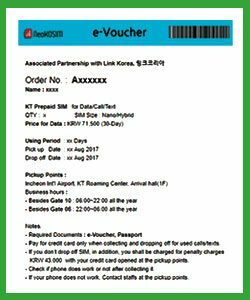 When collecting by Korean ID Card or passport or Drive License or ARC(Certificate of Alien Registration), expiry is given more than 90 days for as you want. Credit Expiry Date can be reduced or data service can be interrupted if using local calls to the number such as, 15xx, 16xx, 02-15xx.., 050, 060, 013, domestic video call. They offer bank account info for top-up at the pickup points. You are needed to transfer KRW 58,500 to their bank account. If you have difficulty by using Korean Bank Transfer, you can pay with PayPal at this page. You are needed to pay USD $ 62 including handling fee $5. If Not recharge within 3 days after expired, SIM Service will be terminated automatically. Send us email promptly if you want to cancel your order or refund, amend order details. Once Prepaid Korea SIM Card (MY SIM FREE B) opened, it is strictly not refundable once sold.